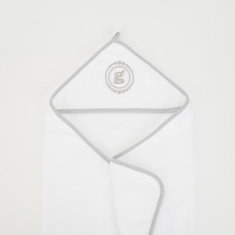 Giggles Printed Towel with Hood | Multicolour | helps to keep baby's warmth and cozy and dry. Save AED 14 (25.45%) – Earn 4 Shukrans What is Shukran? Shukran is the Landmark Group’s award-winning loyalty programme in the Middle East, which allows you to earn Shukrans when you shop any of our brands. Keep your little one comfortable and cosy after a bath by wrapping in this printed towel. Accompanied by a convenient hood, this towel offers maximum absorption. It is soft against the skin as it is made of good quality fabric. Feature 1 : helps to keep baby's warmth and cozy and dry. Feature 2 : helps to prevent baby's from getting chilled.